One of the Conservative party's most high-profile Muslim politicians has criticised her party for being unwilling to tackle Islamophobia in its ranks. Baroness Sayeeda Warsi told ITV News she was disappointed that having criticised Labour over its attitude to anti-Semitism, the Tories were unwilling to "deal with bigotry when it finds itself in our own backyard". 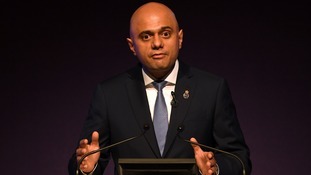 It comes after Sajid Javid, the home secretary, scorned calls by the Muslim Council of Britain (MCB) for an investigation into alleged racism by Tory candidates and members. Baroness Warsi, a former party chairwoman, told ITV News: "What for me is deeply disappointing is that I raised this issue with my party long before the ugly head of anti-Semitism raised itself within the Labour party. "And what I find is that we were quite right to challenge the Labour party on its issue of anti-Semitism, but it now disappoints me and concerns me why we're not prepared to deal with bigotry when it finds itself in our own backyard." The row has erupted as a result of a letter from the MCB to Conservative party chairman Brandon Lewis that highlights alleged racist incidents by party representatives. The incidents ranged from allegedly offensive tweets to accusations of links to the far-right and the letter specifically highlight "shocking Islamophobia" in the campaign run by Zac Goldsmith in his unsuccessful bid to beat Labour's Sadiq Khan to become mayor of London in 2016. Baroness Warsi has backed the MCB's call and believes there is "overwhelming" evidence warranting an investigation. But appearing on the BBC's Andrew Marr show, the home secretary, appeared to suggest the accusations could not be viewed as credible. "The Muslim Council of Britain does not represent Muslims in this country," Mr Javid said. "You find me a group of Muslims that thinks that they're represented by the MCB." Harun Khan, the MCB's general secretary, claimed Mr Javid's comments showed the Conservatives had "no interest in dealing with this matter with the seriousness it deserves".